Welcome to our 125 years celebration of the BERNINA company! We’re celebrating by bringing you lots of inspiration and today we’re taking a closer look at bobbin work! And just what is bobbin work? Read on to find out all about this technique! 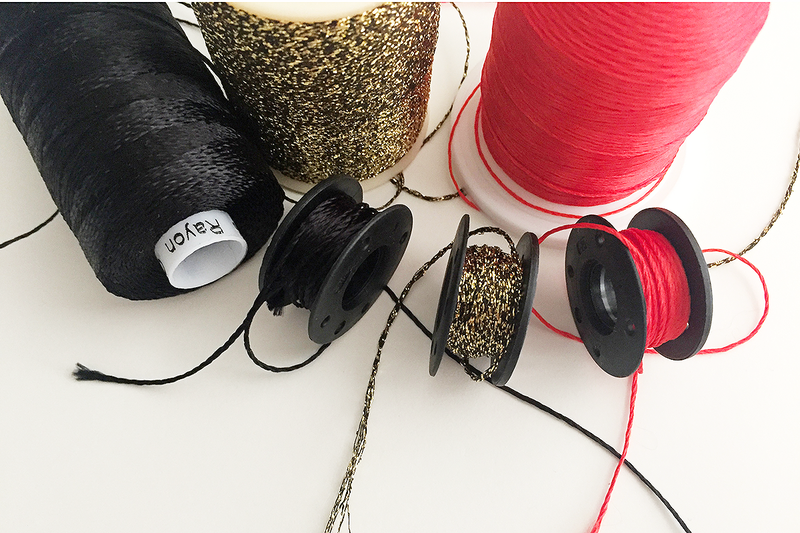 As a bonus we’re giving you the chance to win an incredible set of 28 spools of thread in all the colors of the rainbow, scroll to the bottom of the post to find our anniversary giveaway! What do you do with beautiful decorative threads, thin ribbon, or cording that is too thick to fit through the needle of a sewing machine? Turn it upside down, of course! Wind decorative threads, thin ribbon or cording around the bobbin and sew your project upside down. The top thread will stitch the over-sized threads right to the bottom of the fabric. You can use the technique of bobbin work with virtually any kind of stitching your sewing machine can do, straight or zigzag stitching, open decorative stitching, free-motion stitching, and even machine embroidery (with the right designs). Try using bobbin work with decorative threads, pearl cotton, yarn, ribbon floss, or similar weighted cords and trims. There are a few general tips to setting up your machine for bobbin work. You can read more about the technique of bobbin work with the BERNINA Hook System and Jumbo Bobbin here. Check with your BERNINA store for a specially configured bobbin work bobbin available for your model. If not, it’s a good idea to purchase a second bobbin case for bobbin work to avoid having to re-set the bobbin tension for normal sewing (and to mark it so you don’t get them mixed up, use permanent marker or nail polish). Adjust the tension of the bobbin case so the cord flows smoothly from the bobbin. Wind the bobbin at a slow speed to make sure the thick thread or cording is wound evenly around the bobbin. 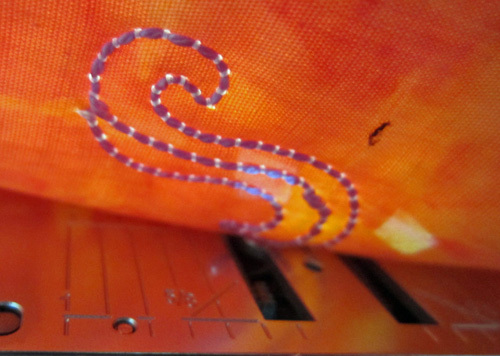 Use an open toed foot such as the Open embroidery foot #20 to help you see exactly where you are stitching. Always test-stitch first and fine-tune your machine settings. Start with a 4mm stitch width and fine-tune from there. Avoid stitches that are too close together that may bunch-up the larger thread or cord. Adjust top tension if needed, the bobbin thread should be laying against the fabric without being squeezed too tight or drooping too loosely. Always bring the bobbin thread tail up through the top thread before starting to stitch to avoid thread nests and machine jams. Look for decorative stitches with wide, open looking designs. Avoid decorative stitches with too much back-and-forth stitching or elements that are very close together. Did you know you can even quilt with bobbin work? Read tips for quilting with this technique here on WeAllSew! October 125 Years Golden Anniversary Giveaway! One lucky WeAllSew reader will win this fantastic set of 28 spool Mettler Metrosene threads! 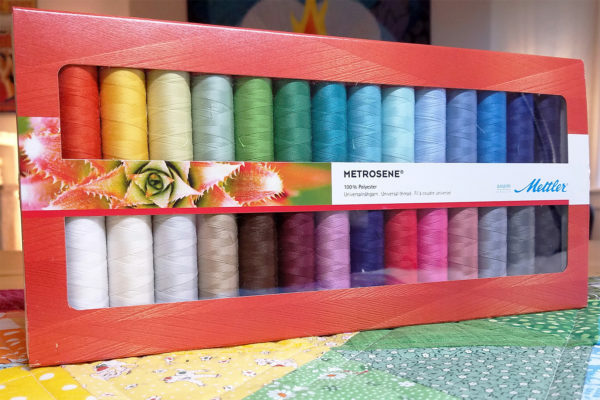 The perfect sew anything thread, Metrosene is a strong, high tensile strength polyester with a smooth finish that won’t easily fray or cause extra lint in your sewing machine. The perfect colors to add to your stash with a value of $40.00. All you have to do is post a comment below and answer the question, “How would you use bobbin work in a sewing or quilting project?” The the giveaway is open through Friday, October 19th. The giveaway is open to residents of the 50 United States and the District of Columbia. One comment per fan. Comment must be submitted to the WeAllSew.com blog by October 19, 2018 at 11:59 PM Central Time. Winner will be chosen randomly. Winner will be notified by email and will have 48 hours to contact to claim the prize. i would love to use the bobbinwork to accent a wallhanging or curtains. I would like to use bobbin work to decorate tablerunners. I would love to become more proficient at thread painting! It adds so much! I used bobbinworks once to make a really pretty sweatshirt with fall leaves. I would love to do more sweatshirts to give as gifts. I used bobbin work with my 200/730 to create a thread painted throw for a dear friend featuring faces of her daughters and granddaughters with moi and faces of my 3 daughters and granddaughters. Friend is now 89 yo. She loved it! I used a variety of black and brown decorative threads on a pale sea foam green background. I’m eager to try the technique on my 880. I don’t know what I would do with bobbin work but sure looks like it would be fun to try something new. Maybe for a wall hanging or something. i would use bobbin work to make flowers on my granddaughters jeans! she would LOVE that! I would use bobbin work in a wall hanging that has raw edge applique – flower on silk fabric, applique around edges with bobbin work, cut silk 1/2″ from applique and fray silk. flower on silk fabric, applique around edges with bobbin work, cut silk 1/2″ from applique and fray silk. I had heard about bobbin work before and always wondered about it. I would use it while free motion quilting to decorate and have unusual and interesting texture and color to quilts!! I’d love to use bobbin work on an evening bag. Bobbin work would be great on an evening bag. I have been wanting to make a pillow using this technique. Imagine how beautiful it would look on a couch! Never tried this technique but would love to experiment. Love Mettler thread, it’s my favorite. What a grand way to add a ‘signature touch’ to a plain garment! I can think of lots of things to try this on! I used bobbin work to make the feelers on butterflies. So many possibilities! I would use bobbin work as trim-like element along the cuffs and lapels of a jacket. This would be amazing on napkin edges. I don’t know what I would do, but I would love to learn! I would use bobbin works as decorative embellishments on skirts and jackets. I would try bobbinwork on a wallhanging, I would want to be able to see it all the time! I have a bobbin work bobbin already. Thanks for the tips and idea! I’m not sure, it would be fun to play around with. I recently purchased a red bobbin for bobbin thread techniques. I want to create cord and ribbon geometric shapes on denim. I tried this in a class at the local sewing machine store. Choice of stitch really makes a difference. It would make a great accent on a jacket lapel or pocket. I am just learning thread painting amd so far….I love it! These colors would be awesome! It would add pa-zazz to my quilting. It’s a great idea, will have to give it a go! I use bobbin work in quilting wall hangings, table runners, and placemats. Wow! This is a great technique that I had not considered. I have learned so much from this we all sew. I would love to play around with it on an arc quilt …a portrait of my horse, Suede. I think this would make fantastic texture & movement in her mane. I would love to try this on the pocket of my blue jeans! to do the decorations on the sashings. I would love to add this to a quilt! I would use bobbin work to make a funky pillow for my sofa. I would use bobbin work on the sashing or the borders of my quilt to add texture, and to add a different look than the rest of the quilted areas. It would look beautiful on a jean jacket or to decorate jeans. I have tried bobbin work years ago but have learned much since then. I would like to make a Wallhanging first for Christmas then take my time and create a bed size quilt with bobbin work. Thank you for offering the thread to create. Bobbin work is just an amazing technique, and there are so many beautiful threads to choose from. I would like to create a stitch recipe to stitch out on a set of pillowcases as a gift. Thread painting would be beautiful with this technique! I have not heard of bobbin work before, but I really love the appearance of it! My first project would be to add some designs or words to the front of a small zippered pouch for my purse. They’d make super gifts to personalize with the recipient’s name or initials. I would love to make bed quilts for my girls as belated wedding gifts . Now that they are older, they appreciate when Mom makes them anything . Being on a limited income , this would help me tremendously in achieving this goal . I’d love to try this technique on a denim jacket. I’m thinking drawing Roses on the inside and use the coordinating threads ie: Red on the Rose, green on the Leaves. Then once I’ve completed the flower I’d embellish it with accents if my choice. I think I would use bobbin work in the centers of my quilt blocks and around the borders to add depth. I would love to try the pillow that is shown in this blog and use it as a wall hanging instead of a pillow using different shades of plus and a small splash of red. Bobbin work looks awesome. Bobbin work would make a lovely accent to table runners, placemats and napkins. I can’t wait to try. I would use this on table runners and table toppers. I would love to use these on a fidget blanket for my mother and others with dementia! Bobbin work would be wonderful for decorating holiday table runners! Wow, so many possibilities! I think it would be fun to personalize a quilt with names or initials and a date for a quilt gift, especially a wedding gift. This is such a clever idea! I would try this for decorative pillows, or to add something really special to a quilt. I’ve got a project that needs some embellishment. I’d love to try doing some bobbin work to add color and texture. Would love to try this! Have not tried this technique. I love bobbin work. years ago I purchased some embroidery designs called DigiBobbE. I love them for quilting designs too! they’re by YLI. I’ve been wanting to learn this technique for years and I think the time has finally arrived! I’m looking forward to doing this with the Jubilee Quilt. I also think it would be a fun and beautiful way to add free motion quilting to so many of my quilts, pillows, and even as accents on some of my clothing, like jeans! I’m so excited for all of the “new” things to learn with my new Bernina! I would love to decorate my plain dress shirts. I’m afraid I wouldn’t use bobbin work because a second bobbin case is so expensive. I’m just learning to applique and now want to try bobbin work. I can’t paint or draw but find I am able to express my creative self with my Bernina. I would definitely use bobbin work for making tote bags. Another great idea for bobbin use is to make your own Christmas tree skirt. I would love using it to put my great-grandkids names on quilts. I would like to try quilting with bobbin work. I would trim my granddaughter’s princess dress. Something new for me to learn. Interested in giving it a try. I would use bobbiinwork to add unique accents to accessories like scarves and bags. I would use it for doing an art quilt. Circles, then later do a regular echo quilting from the right side. I’m not sure, but I’d like to try it in conjunction with a small quilting project. I cut out and started a quilt and realized I did not have enough contrast between the fabrics so the design does not stand out enough. I am hoping that using thicker thread for the quilting will save the quilt! Thanks for the chance to win the thread! I would love to try it in making a “reverse design” on the back of a quilt. I have used bobbin work with my Bernina Stitch Regulator to add free motion embellishments to a small art quilt wall hanging! I have a baby quilt that I have included ribbon in as an inner border. It would be super cute to use bobbin work to quilt with. I have to give this a try. Thanks for the inspiration. I would use it to make outfits for my musician friends! I have used it on a bag I made. Loved the glittery/wool thread I was able to use. I would use it to add more definition to my quilts. Probably by tracing around a motif on fabrics until I get comfortable with it. Thank you for the inspiration. I’d use this technique for textile art pieces. A thicker thread could be used in the bobbin for free motion quilting to free-hand shapes, flowers, leaves etc with scraps of fabric adding a three dimensional aspect. Sounds like fun. I would like to try it on jacket or a beautiful quilt. I love to use bobbinwork for quilting with metallic thread on Christmas quilts. This is something I’ve wanted to try! I could see it used on a garment piece ( reversible jacket maybe) or on a sweet baby quilt or placemats! Maybe even using the Bernina Q24 longarm?! This would be a nice way to accent bags and table runners. I’m getting my first Bernina tomorrow (an old 2nd hand one – 1130) and I want to use the cottons on the Christmas wall hanging I’m doing. I can’t wait to use it. I’m so excited as I’ve wanted a Bernina for years! Bobbin work would look cool on the front of a bag. I would use bobbin thread to embroidery on the legs of jeans. just dreaming… thank you this technique will add so much oomph to my appliques and thread painting. I’d use bobbin work to decorate a special jacket. I would use bobbin work for home dec projects, such as accent pillows and tablecloth trim. I am about to start a comprehensive fabric postcard project. The postcard size would be perfect to experiment with bobbin thread … and share my success with friends and family. And the postcard designs would inspire me to apply the technique throughout my sewing projects. Have not used bobbin work very much but would love to learn more. You know, no truer words were spoken when it is said “you learn something new everyday”. Because I DID NOT KNOW about this technique before now! WOW. I seriously will try it. I do little clothes for dolls and how nice to make simple super and fast designs this way! And.. no kidding, a pillow! borders on a curtain… I am going to try this and soon. I have heard about this technique, but have not really tried it for myself. I think it would add uniqueness to any project you can conjure up in your mind. I like your ideas! quilts, baby bibs, & would like to try it on hand crafted cards! I would like to add accents to table runners and learn the bobbin work technique. I would love to use it for pocketbooks, runners, and baby blankets. I’d love to use bobbinwork on a dress. i would stitch in the ditch with decorative thread on a NYB quilt block to make my pointed pieces really pop! I love to use decorative stitches with bobbin work on my grand daughters dresses I make. Especially for hemming or top stitching! I think bobbin work would look great on blue jean material. And I happened to have both a jean jacket and vest that would be great to try with this technique . I would love to use this technique on a vest. I’ve tried this before without much luck, but these tips may make my next project a success! This technique is very pretty and unique! I would love to try it using redwork Christmas designs to create an heirloom Christmas tree skirt. The possibilities are endless! I’d like to work on a table runner as well as embroidery work on jeans. It would be fun to try this on a grow-chart for my grandchildren! I would like to try the bobbin work on a Christmas stocking. This weekend I took a class from Cindy Needham which included whole cloth on linen and I can see real possiblities for using bobbin work on the piece I plan to do. 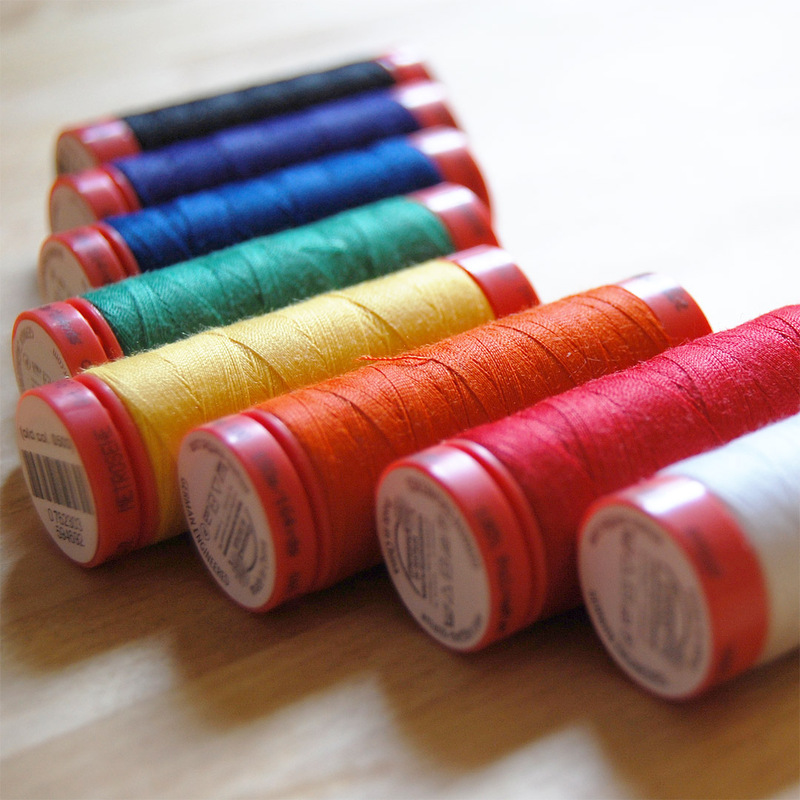 bobbin thread will be my next art quilt experiment! I would like to try a mock redwork embroidery effect. jackets is my favorite thing to sew and decorate. I have used bobbin work on many sewing projects. It’s such a surprise when you finish and turn it over. I want to try it for embellishing all my projects! I’ve got a new crossbody bag pattern that needs some bobbin work treatment! Take photo and put them on fabric and do decorations on hair, ribbons ,bows add these to a small quilt for a hanging. May give it to someone special. I’d use bobbin work on an art quilt to add texture and extra interest. Lots of choices of different threads make it fun just to experiment too. This is a great way to customize a denim jacket and compliment with stitching on denim jeans. I’d like to experiment with adding cord or heavy thread free form borders to hand embroidered quilt blocks and then progress to decorating the back of a jacket. I would use bobbin work on my red jean jacket. I would like to use bobbinwork designs on bags I am making for gifts this year. I would try it on bags. Looks fun. I would like to “play” with bobbinwork and the thread would sure come in handy. Bobbin work around the edges of a jacket body, pockets and/or hem. I make dopp bags, tote bags, back packs pouches, Japanese aprons, and napkins. The bobbin work reminds me of crewel work and I think it would be beautifully presented on my cork and linen handmade items! Thanks for the opportunity! Since Christmas is creeping up fast (in crafting terms), I would use all six strands of floss as one thick thread to sew ferns and fir trees in lovely Christmas greens! The possibilities look endless! I would love to learn and use bobbinwork on clothing for my little grandchildren. Thank you for the opportunity for the beautiful thread! I would use bobbin work to accent shapes, flowers or animals in my quilted projects. I would use this technique to add interesting motifs to quilt blocks – especially sashing and borders! Oh my goodness. what a creative group we have here! After practicing quite a bit, I would love to embellish my daughter’s wedding gown with this technique. I would use bobbin work as embellishment especially on jeans, jackets, and pillows, but I think it could add a decorative and fun touch on just about everything. Bobbin work would be great on a garment to do a larger bold design without a lot of stabilizer remaining. I would like to try bobbin work to jazz up the back of my grandkid’s quilts. I think I’d love to try quilting with the thread. It sounds like a lot of fun. I have been repurposeing heans as pillows and bags, I would love to use bobbin work on them in place of the hand embroidery I have been doing. I hope to sew a pumpkin wall hanging using this tonight. Oh my gosh! How inspiring the colors are to me. I am an art quilter, surface design person. I love doing underwater designs, making sea plants, using beading and making crazy fish with threads that follow them as part of the design..could I use these luchious threads? Heck yeah! Would add to the world of the underwater beautifully! Love bobbinwork on my 830. I used it to embellish a round robin when it was my turn. I used one of the big fancy stitches and a metallic braid to stitch embelish a border. I would use it to add embellishment to any project! I do have a special bobbin for my machine, but haven’t used it for a project yet. Thanks for the tips! I have been using bobbin work in a quilt that is all about flowers! I would like to give bobbin work a try on a wall quilt or a table runner. Building up my confidence, I would go on to a very special quilt I am now working on. Thread painting leading to a beautiful table runner! I would love to use decorative thread in bobbin work to embellish a denim jacket. I would like try bobbin work on various types of bags and totes. I think it would be fun to try on a Crazy Patch project like a evening hand bag with sparkly thread. I like using bobbin work next to the binding on a quilt (in the ditch). It’s also fun to add texture to plain fabric for garments or bags. I would use bobbin work for a holiday wall hanging using gold thread on dark green wool felt. Metallic thread bobbin work would look fantastic on an evening bag for the holidays. Thanks, as always, for the excellent tips! This would be a great way to use unusual threads in a prominent way. Can’t wait to try it ! Gorgeous! I will definitely be trying this! I am looking forward to working on this new-to-me technique. Creating and embelllishing new things can be so much fun!! The thread set would enhance my new adventure!! I would use bobbin work on table runners, wall quilts, totes with appliqué, and my very special art quilt all to add interest and accent with decorative threads. Thread painting is on my bucket list! That technique looks interesting. I am going to have to try that on a wall hanging I am working on. (first comment incomplete…got away from me! I can see where the bobbin work could add a unique focus point on a bag, or any project. It would be fun to experiment with quilt squares before sewing blocks together. I have six blocks left to finish my quilt Stitchers Garden quilt top. The six blocks are suppose to be bobbin work. I’m afraid to make adjustments to my bobbin case. The last time I did bobbin work was maybe 11 years ago in a class at my Bernina store. Someone there did the bobbin adjustment. The project turned out really nice. I am sure I did this technique years ago when I bought my Bernina. Would love to do a project with the bobbin work. I would start with something for my grand daughter. Maybe a table runner or decor for her new house. So many choices!! I love to use bobbin work to accent the bindings on quilts, placemats and jeans. It adds that personalized touch to a quilt binding and pushes it from “finished” to “WOW”. Using it to spiff up a pair a jeans at a fraction of the cost is just a plus where i am concerned. It makes things individual and personal! I would use bobbin work on cloth handbags and doll clothing. I would use it to embellish some quilting on a future project. The idea is just in my head. Would I do it on the top or would I wait to do it on the quilt! Hm m m m need more time to think about the possibilities and some time to play with the options! I’d love to use bobbin work to do decorative embellishment on a jacket or vest. I might first use bobbin work on some placemats for accents and creating a vine like effect. I would use bobbin work with the fantastic set of 28 spool Mettler Metrosene threads to create a topographic map on the face of a pillow cover because I love maps and drawing with thread. I would like to learn bobbin work, I think it would add fun designs on different projects. I would love to make Christmas placemats! I think once I learned it would open endless possibilities! I like to use bobbin work on pillows and special jackets. Thank you. Bobbin work would look so nice on a wall hanging in my Sewing Studio. Bobbin work adds just the right accent to any project & lends itself to being “seen” in the work which is a plus. Love to win & try my hand (machine) out on bobbin work. I would love to use bobbin work to accent the quilts I am making for my grandchildren. I would use bobbin work in my free motion quilting, using my BSR. When I quilt for my granddaughter’s quilts, I like to write messages in the borders – bobbin work would make that stand out more. It would also add a bit of interest to bindings. I’m going to try incorporating bobbin work into my free motion wallhanging projects. I think I’d like to try bobbin work on a pair of jeans, down one leg, or on a collar or cuffs. Actually, the more I think about it, the more things I can think of using it on. Maybe bobbin work on Christmas quilted ornaments and table topper. I once used it to make a tri-fold sewing supplies caddy. It came out absolutely stunning! Would love to try it again on something–maybe incorporate it into my crazy quilting! I would love to try this as a decorative stitch on my grandchildren’s clothes. I have never tried bobbin work before but I’d love to!!! Looks like fun!! I have two queen quilts to finish before Christmas and I would love to use bobbin work to enhance the designs and really make each one unique as well as beautiful. Thank you so much for great idea. Can’t wait to practice it. Any kind of cloth or bag, or quilt will benefit using this beautiful stitch technique. I would love to try an embroidery design with the bobbin work technique – could open a whole new world for me! I love bobbin work. I used to do bobbin work on my lovely Bernina 1630 but My wonderful husband has just bought me and amazing Bernina 830 which I am still ‘playing’ with and getting to grips. So I will be looking forward to trying out Bobbin Work on new amazing machine. I would use bobbin work to add accents to a linen blouse that I bought several years ago that I never wore because it was too small. Now that I’ve lost weight, it fits nicely and would look beautiful with some added bobbin work. Oh my goodness! I would is bobbin work on all kinds of things; quilts, costumes, clothing and as accenting on journals and art work! The possibilities are endless! I would make a Christmas Tree with bobbin work and use it either as a wall hanging or table runner. You could even use it for the ribbons on the packages under the bobbin work Christmas Tree. Ideas are perculating. I think I would use this technique as embellishments on bags, totes, and jackets. Once I am better at bobbin work, I would LOVE to try it on some open squares on a quilt. I would use bobbin work on a purse or clutch. I am working on a dress for my granddaughter and doing a raised flower border along the full skirt bottom would be so pretty. I’ve used a heavy silk thread with bobbin works to make a side of a cosmetic bag. Works great! I sewed a lot for my daughter when she was a child. When she became a teenager she wasn’t quite so confident in my ability! She is now older and wiser and I’ve become her own personal seamstress again. I’d love to use this bobbin work technique on a dress for her. Perfect for crazy quilt embellishments! I would use this to mimic hand quilting my mother and grandmother did back in the 1950’s and 1960’s. They used a heavy, size 8 Coats and Clark I think. The quilts were more utilitarian back in those days, especially trying to raise a family and make ends meet. I remember the last quilt my mother made, I would thread a whole pack of needles for her to use the next week before I headed off to college for the week, only to return to do it again. She would always make the comment that she did not have enough threaded needles to last the week. I would use bobbin work on Christmas socks and projects. There are so many fun ways to use bobbin work. A pillow would be a great practice piece. I love making jackets which would be a perfect place to incorporate this beautiful detail. Oh so pretty rainbow colors of thread! I would make flower designs using decorative stitches and turn into quilt blocks. I’ve used bobbin work on a vest that I made years ago. I would like to do it again on a baby quilt. It is a unique embellishment to most any project and easy to do. Most of the time the results are better than what you intended. I’d love to try bobbin work on a wall hanging or table runner. I would decorate a set of quilt squares, maybe denim or gray twill. Oh what fun to use on a quilt for a young teenager then to accent with hand quilting. I am currently working on a waterfall quilt that uses bobbinwork, so this would be perfect. Also, the Autumn Table Topper would be perfect, also found on this blog. I have a 200/730 and make bags for my family–daughters, daughters-in-law, grandchildren and your very good instructions are leading me to use bobbin-work along with embroidery for embellishing purses and bags. I have a tree of life panel that I’ve put borders on and appliqued with butterfies for a friends who’s husband has past. I would love to use all those colors doing thread art in the quilting so the tree would be decorative and show on the plain backing as well. I am thinking on a table runner, then it would be reversible. I would decorate a quilted wall hanging. I love bobbin work on pillows because it gives them dimension – such a professional decorator look at a fraction of the price of a store. One of the first things I bought for my new B700 was the red bobbin case. I have used metallics and cords. It is great for Christmas projects like stockings too. I plan to do some bobbin work to embellish a Christening gown I’m making for a friend so they can use it for all her grandchildren. I would love to learn this technique to use on future quilting projects and some embroidery projects. I use bobbin work to embellish quilt blocks and tote bags. I would use bobbin work for embroidered jacket. I make a fall fabric leaf bowl using moldable interfacing and bobbin work would work would be great for the veins of the leaves. I would love to free motion with bobbin work on the back yolk of a jacket. I also have a free motion wall hanging idea that’s been ruminating in my brain for several months. Bobbin work would be perfect for this project. Thank you for the tutorials! This would be fun to try on a quilt border or on a table topper. I can’t wait to learn this technique to decorate throw pillows! I think bobbin work would be great on garments, purses, etc. I’m looking forward to learning how. I would like to use bobbin work to make a sparkly quilt label with my name on it. I create Renaissance costumes, more on the historic side vs costume. I could use this technique as a way to embellish skirts and bodices and other pieces of clothing. Thank you for the article. I bought an extra bobbin case for bobbin work, but have never tried to use it. I’m not sure where to start. I would use bobbin work sewing to decorate the bottom legs of my jeans. It gives a ‘retro’ look that I like. I’ve couched designs in the past and have gotten many compliments, I would really like to try the bobbin technique! I would use bobbin work to add extra decoration around the quilt label that I embroider to go on the quilts I make and to dress up designs that are outlines in one color with no fill stitching..
i would use it to make 2-sided taffeta scarves. And couch fluffy clouds that are airborne. Or add ribbon to a balloon held by a raccoon. And play at making marshmallow fluff. I’d make glitzy antlers on a Christmas stag. Possibilities are endless & quite a breakthrough! I would use bobbin work to embellish a skirt and oh what fun I would have just playing and experimenting. How fun! I would love to try it on kitchen towels that I machine embroider! I sew garments. I have yards and yards of mostly solid vintage silk, linen and cotton fabric that my Great Aunt Irene left to my mom. 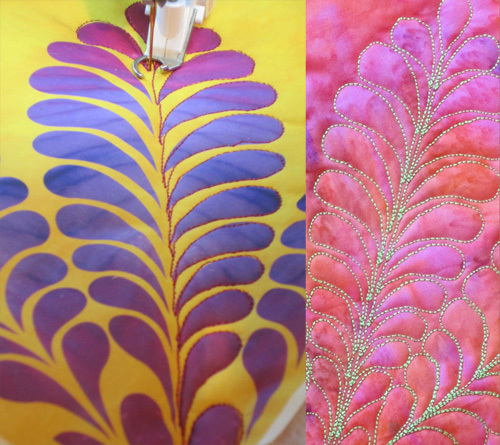 I would love to embellish these fabrics for that haute couture look! I would love to try bobinwork on my new new grandchild’s quilt arriving in November. Using a machine & threads specifically made for Bobbin Work would be so creatively liberating! I’ve been doing “Bobbin Work” for a long time but didn’t know that was what it was called. I called it “using your fancy stuff in the bobbin”. The idea came from using heavy thread in the bobbin when gathering all those late 1969-80s ruffles! Thank You Gunne Sax. I probably first used Bobbin Work with fancy metallic threads that kept tangling in the needle. And with heavy threads that were too big for the needle. Then I went wild with yarn and ribbon embellishments. Now I’m quilting some pretty unorthodox stuff. What to use Bobbin Work for? The list is long: Christmas decorations and ornaments, banners and flags, Halloween Costumes!, string and leather laces and fine rope on RenFest wear. Ribbons on Prom and other formal wear, quilts & pillows, faces and other details on stuffed toys, embellishments of all kinds on jeans and tops. It makes great candlewicking and “red work” embroidery: do all the plainest stitching by machine and then do the fancy /fun stitches & knots by hand. Right now, I’m making a quilt using a cloth baby book panel. The “pages” have embellishments. The quilting around the “pages” has all kinds of textures in the quilting. I would love to try bobbin work on some clothing for my granddaughter! I want to learn bobbin work to create pretty lines on my crazy quilt. I have decorative stitches and now want to add pretty thick threads to accent the crazy pieces. It would also look lovely on my nightgowns. I always use old sheets for my nightgowns and would love to make them fancy with beautiful threads on the bodice and sleeves. Thanks. I would love to try bobbin work when free motion quilting a small quilt I am making for a wedding gift. I am looking forward to using bobbin work on a decorative pillow. I have never seen this before. How cool! I would love to try it on a jeans jacket. What a great blog post. Thank You. I would like to give it a try on some things I would typically machine embroider. It has a much less dense appearance. I’ve been doing embroidery on gift bags. I think the ability to use a heavier thread AND the less dense pattern would lend itself perfectly for a burlap gift bag. I love to try bobbin work on a beautiful everyday purse. Then, maybe, if it turned out good enough, make a skirt or jacket to match. After that, anything is possible. Would love that thread to practice with! Not sure why I’ve never tried this? Planning to try on a Fall tablerunner. Ohhhhh. Pillows and crazy quilts. I would love to use bobbin work to create two sided items like a scarf, with applique on one side and embroidery on the other side. I have a love of Christmas Holly and want to make a table runner using BobbinWork to sew a Holly design. This sounds like a wonderful way to create beauty. Thank you for the inspiration!! Having just purchased the 880 Plus Anniversary Edition, I’m new to the Bernina Family and am so eager to learn new techniques! I’m already amazed at all the things I can do. I would love to add bobbin work to small quilting projects. I have worked alittle on bobbin works. Need to work on it some more. A fun project! Would love to have the 350! Use for some baby clothes or bib designs. I would like to use bobbin work on jean’s, jackets and sweatshrts. I would love to do some bobbin work on my jackets, Blouses and shorts I love to be different !! I have my second bobbin case, now I just need beautiful thread. I purchased a second bobbin case for thread work because I didn’t want to risk messing up the perfect tension on my machine. Wonderful to add a dimensional element to any project. Have done flowers and even simple designs to add interest to a few projects. Great “how to” information that will inspire others to explore this technique. I want to make table runners and placemats for the holidays. Bobbin work on a vest would look great. I would use bobbin work for decorative quilting. I have a second bobbin case and love to do bobbin work. This review was great, now I just need more thread to make a table runner for Christmas and maybe Easter in case I don’t get Christmas made in time. I would love to do bobbin work! Looks scrumptious!